Definition: The LCD is defined as the diode that uses small cells and the ionised gases for the production of images. The LCD works on the modulating property of light. The light modulation is the technique of sending and receiving the signal through the light. The liquid crystal consumes a small amount of energy because they are the reflector and the transmitter of light. It is normally used for seven segmental display. The liquid crystals are the organic compound which is in liquid form and shows the property of optical crystals. The layer of liquid crystals is deposited on the inner surface of glass electrodes for the scattering of light. The liquid crystal cell is of two types; they are Transmittive Type and the Reflective Type. Transmittive Type – In transmitter cell both the glass sheets are transparent so that the light is scattered in the forward direction when the cell becomes active. 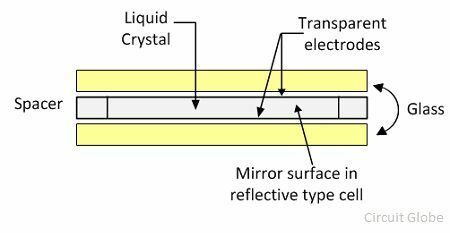 Reflective Type – The reflective type cell consists the reflecting surface of the glass sheet on one end. The light incident on the front surface of the cell is scattered by the activated cell. Both the reflective and transmittive type cells appear brights, even under small ambient light conditions. The working principle of the LCD is of two types. 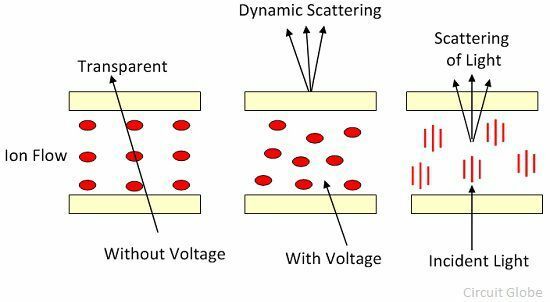 They are the dynamic scattering type and the field effects type. Their details explanation is shown below. The construction of liquid crystals is similar to that of the dynamic scattering types the only difference is that in field effect type LCD the two thin polarising optical fibres are placed inside the each glass sheet. The liquid crystals used in field effect LCDs are of different scattering types that operated in the dynamic scattering cell. The field affects type LCD uses the nematic material which twisted the unenergised light passing through the cell. The nematic type material means the liquid crystals in which the molecules are arranged in parallel but not in a well-defined plane. The light after passing through the nematic material passing through the optical filters and appears bright. When the cell has energised no twisting of light occurs, and the cell appears dull. The following are the advantages of LCD. The power consumption of LCD is low. The seven segmental display of LCD requires about 140μW which is the major advantages over LED which uses approximately 40mW per numeral. The cost of the LCD is low. The following are the disadvantages of LCD. The LCD is a slow device because their turning on and off times are quite large. The turn-on time of the LCD is millisecond while there turn off time is ten milliseconds. The LCD requires the large area. The direct current reduces the lifespan of LCD. Therefore, the LCD uses with AC supply, having the frequency less than 500Hz. The LCD requires AC voltage for working.